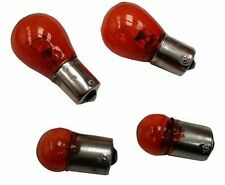 ukscooters VESPA ORANGE INDICATOR BULBS X 4 FRONT AND REAR PX LML P DISC . 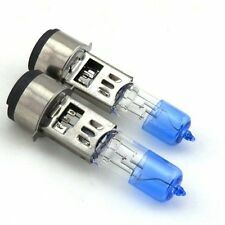 2 pieces of 12v, 50/50w Headlight Spare Bulb. Low high Beam. A good spare light for motorcycles. Rear/Tail Lights for 50cc-150cc ATV. SKU#:PART13015. Light Bulb (40V, 10W). 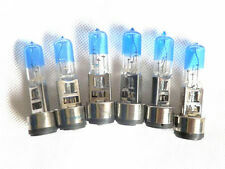 Headlight Bulb 36V for 500WF36V (40V 10W). Total length of the bulb=33.50mm. electric scooters farings (6). Other (1) © 2003-2017 Fancy Scooters LLC. fuse,fuse basket (4). Front Signal with 2 wries (36V). Brake Pedal etc (3). Front or rear Signal. 1,CRANK CASE (8). 10,CRANK SHAFT (2). gas scooter switch buttons (11). Storage Box,Lock (5). gas scooter farings (43). SKU#:PART13021. Site 10699/10500. Size 0x0x0 in (0x0x0 cm). 0 lbs 2 ozs. SKU#:PART13014. Light Bulb (24V, 10W). Front Turn Signal Bulb 24V for PART13011. Total length of the bulb=33.50mm. electric scooters farings (6). Other (1) © 2003-2017 Fancy Scooters LLC. fuse,fuse basket (4). TWO 12V 10W/5W CHINESE MOPED & SCOOTER TURN SIGNAL LIGHT BULB - CLEAR. Brake Pedal etc (3). 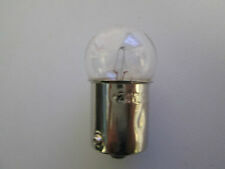 Light Bulb (12V/10W/5W) for ATV506,516, FB549. Total length of the bulb=33.50mm. gas scooter switch buttons (11). gas scooter farings (43). Handle Bar, Foot Peg,Mounts (25). FB549C Zida 110cc 4-stroke Ninjia Bike with Clutch. Light Bulb (12V, 5W). Front Turn Signal Light Bulb (12V, 5W). PART13119 Headlight for Peace Mini ATVs (DOT). PART13120 Headlight for GS-600 (DOT). 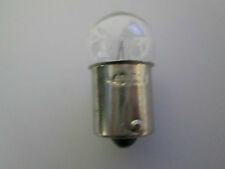 Front Turn Signal Bulb for 49ccXP. Other (1) © 2003-2017 Fancy Scooters LLC. Headlight Bulb (12V 18/18W) for GS-808. Type LIGHT BULBS. Manufacturer Part Number TP-13M037. Size 0x0x0 in (0x0x0 cm). Site 10799/10500. UPC Does not apply. 0 lbs 2 ozs. Light Bulb 56V 10W/5W (Dual). Can be used on 36V, 48V electric bikes. gas scooter switch buttons (11). gas scooter farings (43). Storage Box,Lock (5). Brake Disc Rotors (24). Brakes (147). fuse,fuse basket (4). SKU#:PART13020. Triple Tree Bearings (5). electric scooters farings (6). Other (1) © 2003-2017 Fancy Scooters LLC. ATV Remote Kill Box (1). fuse,fuse basket (4). Brake Disc Rotors (24). engine muffler (1). SKU#:PART13026. Light Bulb (40V, 3W). 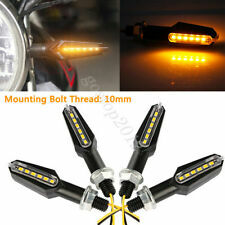 Front Turn Signal Bulb for 500WF36V. electric scooters farings (6). Other (1) © 2003-2017 Fancy Scooters LLC. fuse,fuse basket (4). Brake Disc Rotors (24). 10,CRANK SHAFT (2). Fuse,fuse basket (4). Brake Disc Rotors (24). 10,CRANK SHAFT (2). engine muffler (1). muffler brackets,Bolt​s,Nuts (5). muffler gasket (2). Tire,Tube,Rim,​Hub,Wheels (127). Gas/Pocket Bikes, ATV Mufflers (21). Ignition,teth​er safety key (32). Chock cables (4). PART13140 Electric ATV Front Headlight (36V) 4 Wires. Triple Tree Bearings (5). Bearing (13). Bearing Seals (13). fuse,fuse basket (4). ATV foot brake (1). SKU#:PART13025. Light Bulb (24V, 3W). 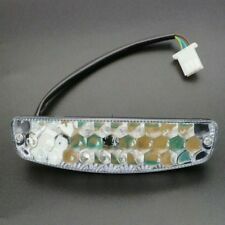 Front Turn Signal Bulb for 350WF24V. electric scooters farings (6). Other (1) © 2003-2017 Fancy Scooters LLC. fuse,fuse basket (4). Brake Disc Rotors (24). 10,CRANK SHAFT (2). SKU#:PART13018. Light Bulb (40V, 8W). Headlight Bulb 40V 8W for PART13009. Triple Tree Bearings (5). electric scooters farings (6). Other (1) © 2003-2017 Fancy Scooters LLC. ATV Remote Kill Box (1). 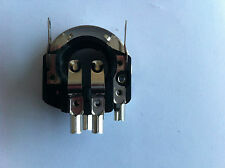 LAMBRETTA BULB HOLDER HEAD LIGHT. QUALITY CASA ITEM. SUITABLE FOR SERIES 1 AND 2 MODELS. 12Volt 50/50 Watt Halogen Lampe, BA20D. 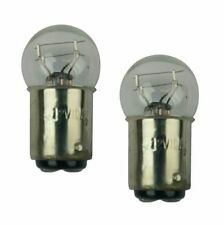 - 2x 12Volt 50/50 Watt Halogen Lampe. We will try our best to reduce the risk of the custom duties. Cap type: BA20D. 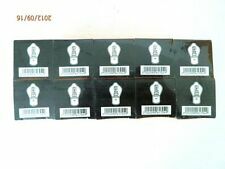 10 PIECES OF 12V 35/35W Motorbike Headlight Bulb. APRILIA SPORTCITY 300 CUBE 2012. FOR SALE IS A USED PART REMOVED FROM A 2012 APRILIA SPORTCITY 300CC CUBE. (INJECTION MODEL). HEAD LIGHT ASSEMBLY WITH BULBS AND WIRING. LED Power: 36W. 2 pcs of 36W LED Bar, and Installation bolts. Beam Type: Flood BEAM. Mounting Bracket: Stainless teel bracket. Life Span: 50000 hours. 1, 150 degree Adjustable Trunnion Bracket Mount;. We Use High Quality Raw Materials and Maintain International Standards. Color : Green. Note: Hanging Ribbon's color may differ. WE WILL DO OUR BEST TO SORT OUT YOUR PROBLEM. ANY USE OR MODIFICATION IS NOT ACCEPTABLE. Blackwire for negative, red wire for red light high beam, white wire for red lightlow beam, yellow wire for right amber light, green wire for left amber light. Material:Soft rubber strip with 3528 SMD-LED. APRILIA SPORTCITY 300 CUBE 2012. FOR SALE IS A USED PART REMOVED FROM A 2012 APRILIA SPORTCITY 300CC CUBE. (INJECTION MODEL). TAIL LIGHT ASSEMBLY WITH BULBS AND WIRING. ALARM SIMULATOR FLASHING LED RED LIGHT WARNING STICKERS - CARPOINT CPT0510020. Very convincing. Red flashing light. Our aim is to provide the accessories you need to personlise your vehicle, protect your vehicles interior and make driving easier. 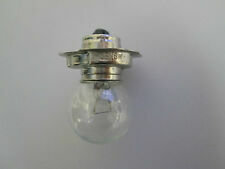 This bulb is a halogen version of the standard BA20D Bosch fitting bulb that is found as standard in many Chinese motorcycles and scooters. It will provide a brighter, less yellowed light than the standard bulb fitted. BAY15D Car Lamp Holder For JGF 1157 Brake Lamp Holder 1157 Double Point Lamp. Small size with huge function, help you hold car lamp or brake lamp stable. Conduct electricity to the bulb. Apply to turn signal, brake lights and so on. This taillight is not DOT approved. We also carry a wide range of spotlights, headlights, tail lights and indicators in the hottest and latest designs. ALL IMAGES ARE THE PROPERTY OF ALCHEMY PARTS LIMITED & THEY ARE NOT ALLOWED TO BE COPIED WITHOUT THE OWNER'S CONSENT . BAY15D Car Lamp Holder For JGF 1157 Brake Lamp Holder 1157 Double Point Lamp. Small size with huge function, help you hold car lamp or brake lamp stable. 1 lamp holder (with cable). Apply to turn signal, brake lights and so on. This bulb incorporates both dipped and main beam functions. Zing BikesEcho 50cc LF50QT-8D. ZenncoMatrix WY50QT-16. YiyingTommy 125 YY125T-19. YibenGladiator 125 YB125T-15(B), Hurricane 50 YB50QT-9, Hurricane 125 YB125T-22, Scout 50 YB50QT-3, Storm 50 YB50QT-6, Strider 125 YB125T-15, Striker 125 YB125T-22D, Zoom 125 YB125T-22C. Genuine Mazda MX-5 ND 2015- White Welcome Illumination Light Kit. Directly replace the OEM two-pin flasher. Work to replace most 2-pin flasher. 1 Pc x 2-Pin LED Flasher Relay. Works for most motorcycle/bike to fix the LED bulbs related turn signal light hyper flashing, not function properly issues. Good for many vespa models. Indicator bulbs. Our aim is quite simple, to provide a high quality product at lowest possible prices along with a fast and efficient service. All orders are despatched promptly from our UK based warehouse. Our aim is quite simple, to provide a high quality product at lowest possible prices along with a fast and efficient service. All orders are despatched promptly from our UK based warehouse. Good for LI s3 tv sx. ZippTriad BT49QT-12F1, Zico BT49QT-28A. Zing BikesBeat 125cc LF125T-9A, Echo 50cc LF50QT-8D. ZenncoMatrix WY50QT-16, Saturn DFE50QT-F. YiyingTommy 125 YY125T-19. YibenGladiator 125 YB125T-15(B), Hurricane 50 YB50QT-9, Hurricane 125 YB125T-22, Scout 50 YB50QT-3, Storm 50 YB50QT-6, Strider 125 YB125T-15, Striker 125 YB125T-22D, Zoom 125 YB125T-22C. GileraRunner SP 50 RUNNER SP 50. Colour: Amber. ZippTriad BT49QT-12F1, Zico BT49QT-28A. Zing BikesBeat 125cc LF125T-9A, Echo 50cc LF50QT-8D. ZenncoMatrix WY50QT-16, Saturn DFE50QT-F. YiyingTommy 125 YY125T-19. Zing BikesEcho 50cc LF50QT-8D. ZenncoMatrix WY50QT-16. YiyingTommy 125 YY125T-19. YibenGladiator 125 YB125T-15(B), Hurricane 50 YB50QT-9, Hurricane 125 YB125T-22, Scout 50 YB50QT-3, Storm 50 YB50QT-6, Strider 125 YB125T-15, Striker 125 YB125T-22D, Zoom 125 YB125T-22C. 6 Pieces of Performance Xenon Motorcycle Scooter headlight bulb 12v 35/35w Headlight bulb, fits a lot of chinese scooter,motorcycle and quads Base: BA20d This bulb has low and high beam, 35/35w. We will try our best to reduce the risk of the custom duties. 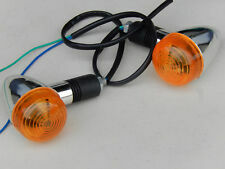 4Pcs Motorcycle Turn Signal Light. 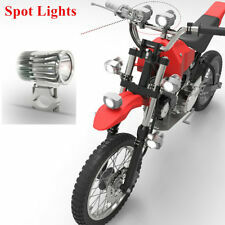 Type: Motorcycle Turn Signal Light. TypeTurn Signal Light. Colour: Black. ColorBlack Amber. Usageturn signal/indicator lights. Classic Motorcycle PartYes. LED Color: Amber. Newly designed corn light bulb with 360 degree beam angle. Using bright 5630 SMD, luminous efficiency 90LM/W. Color Temperature: 3000K. Place Card Photo Holder Party Wedding Favors. Energy saving. Compared to traditional light bulb, it can reduce electricity consumption by 80%.